I’d like to welcome Kyle as a poster here. I’m sure his projects will be an interesting addition to this site. Over the past year I have been travelling a lot and also working quite a bit. 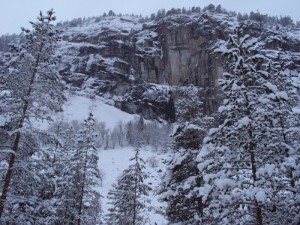 It looks like 2012 will be some of the same, but I’ll also try to live outdoors more again. Inspired by the “Happy People” video I decided to make a couple of those sable traps (Martes zibellina). Although the sable is long since extinct in this area (if they were ever here), we have pine marten (Martes martes), which is very similar. 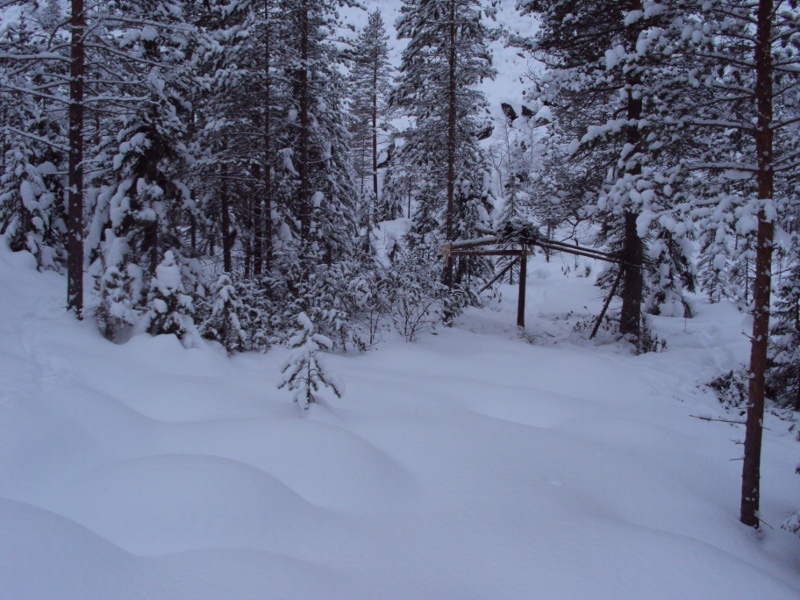 A side note about the photo below is that I stuck most of the branches from the felled pines into the snow to make it easier for the moose to eat their needles. 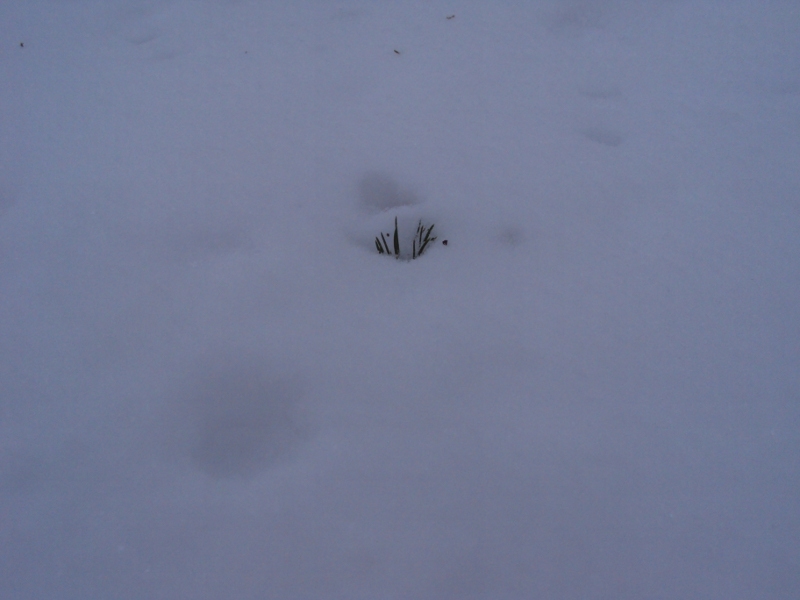 Since people started only planting spruce, even where there used to be pine, I fear that the moose has too little quality winter feed available to them. Back to the trap. Almost everything about it is fantastic. It doesn’t dislodge easily when it’s not supposed to, but still locks in place quite well when sprung. You can use lighter weight logs than with a regular log deadfall and the roof makes maintainance less needed. From now on I’m going to make all of my traps with such a roof. The bait stick is stuck into the roof, making it pull directly out of the notch when bait is taken. Normally the trigger twisting can be a problem, but this is eliminated with this set up. The bait is out on the side, so that the marten has to stretch his neck and get his body between the logs. Because of the roof, the bait won’t be snowed on. 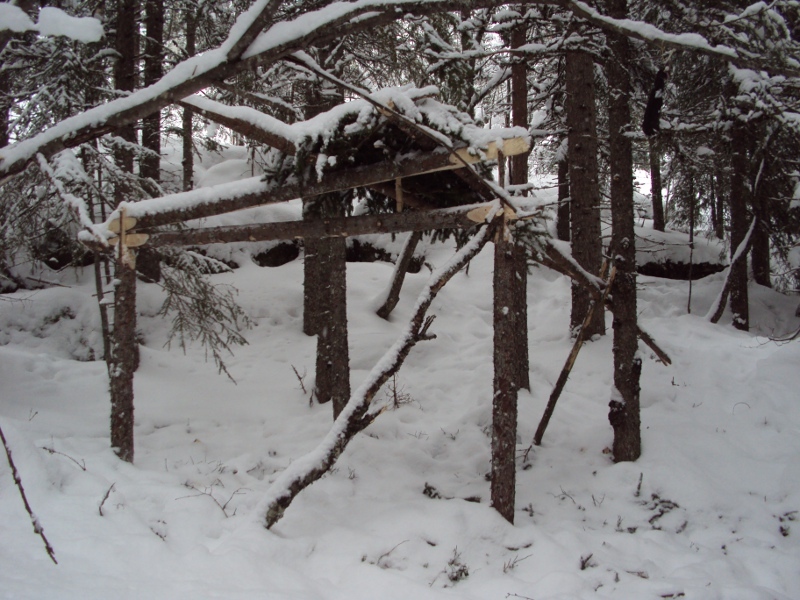 To eliminate the need of tying the roof logs, a cleft stick is used to support them against a tree. The climbing pole directs the marten in from the right side of the trap and makes them more likely to bother with going for the bait. The trigger sticks are tied with a string to the trap itself (with sufficient slack of course). This eliminates the problem of having to replace them because they’re lost in the snow when released. On the minus side it can be mentioned that it takes 2-3 hours of work to make (plus triggers) and that the trap isn’t really practical to make without a metal axe available. I’ve never put all that much effort into trapping, but with this new tool I’m more eager to do so. Here is a photo from the common type of habitat in the shade side of the valley floor. Mixed pine and spruce with the occasional birch. 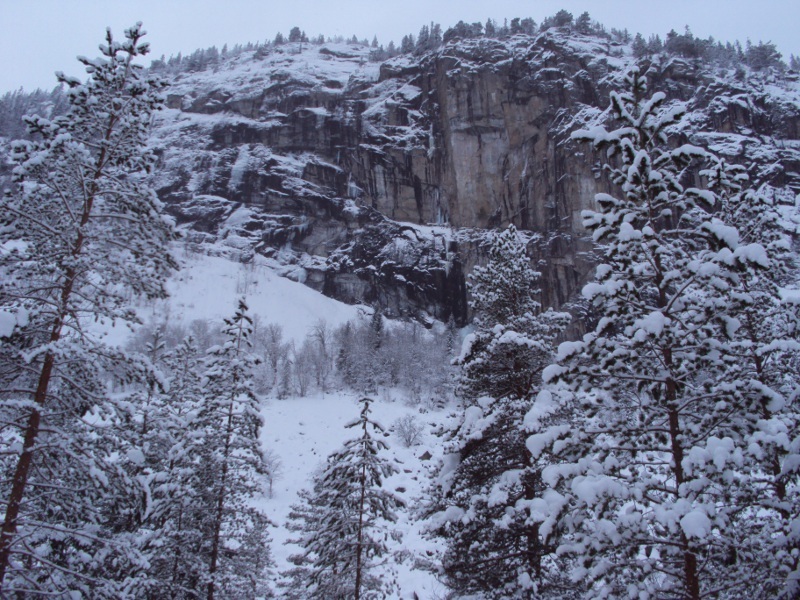 Another picture looking up onto a mountain called Ramnfjødd (Raven mountain). This picture doesn’t look all that exciting, it’s of the tip of a pine branch. These sometimes lay in clusters under certain trees. They signalize that the capercaillie has been feeding above, which they usually do when food becomes unavailable on the ground. Sometimes you can also find their poop mixed with the needles. They usually have a few trees they favour, so if you take note of these trees you can return at another time, sneak upon it and shoot the bird. My name is Kyle. I live in the Inland Northwestern United States. I am on a somewhat different path than Torjus and Thomas. I have not achieved the dirt time or the craftsmanship these two have. 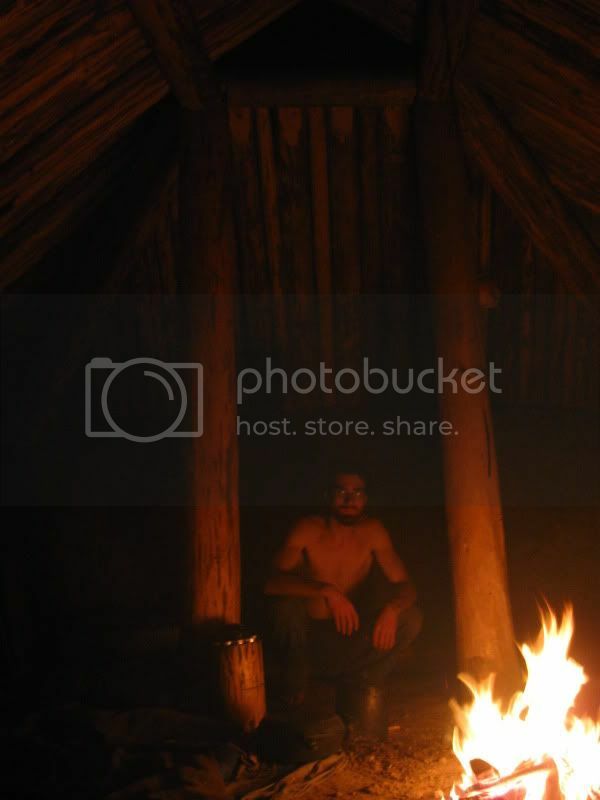 I am nonetheless very passionate about primitive living. 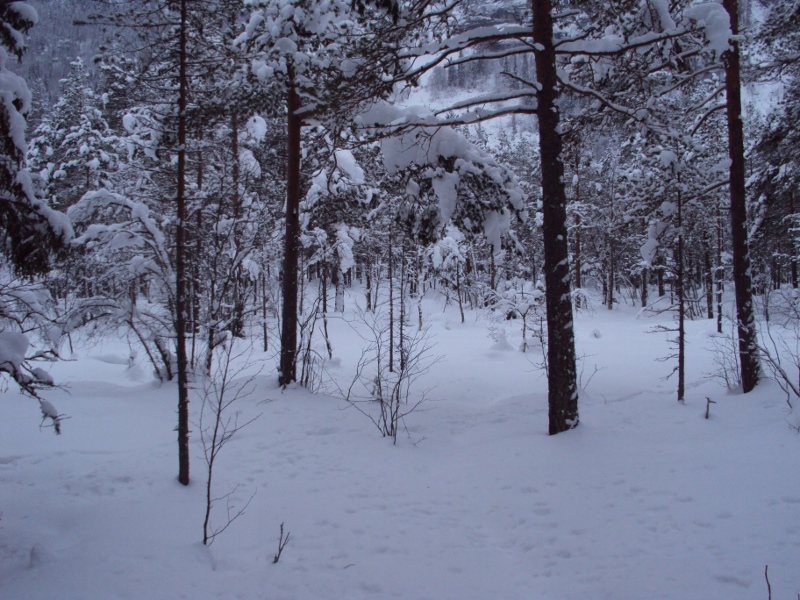 As a teenager I spent some time as hunter/gatherer in the steppes and forests of my region. Those experiences were more powerful for me than anything I’ve encountered since. As and adult, I’ve worked to curb the trajectory of my modern existence toward the sanity and dignity of the hunter/gather lifestyle. And I’ve wanted to do it in a way which is gradual, reasonably comfortable, and replicable by others.My plan centers around my relationship with the land. I’ve played the modern game to win land I can call my own; twenty acres, above the confluence of the Kettle and Columbia Rivers. Here, I am working to foster an optimal human habitat, a forager’s paradise. I want to create a lifestyle here which is healthy and human. It’s an experiment, but then, so is modern civilization. I think we need more experiments! 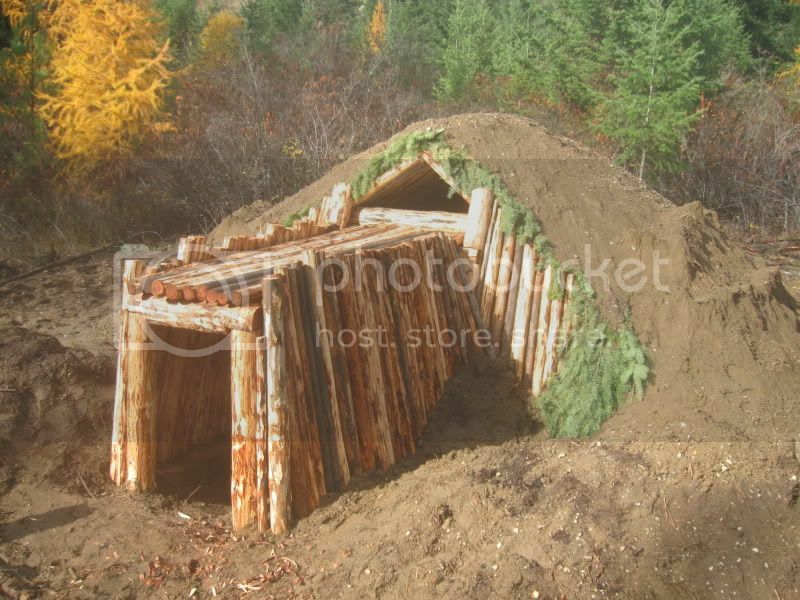 In the fall of 2009 I built this pit house. 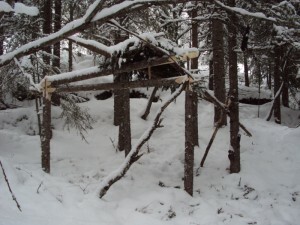 My then partner and I needed a shelter for the winter, and I’d always wanted to build one. We were broke, so the pit house was actually one of the best options available to us. It didn’t cost a dime to build. All the materials were gathered on site. Pit houses, also called earth lodges, kekulis, or ‘quiggly holes’ were the traditional winter dwelling of my region, the Plateau. Similar structures seem to have been used circumborealy. Pit houses of are of archaeological interest because they indicate a transition to more sedentary lifestyles. They were used by sedentary or semi-sedentary fishing cultures, also by farmers. The pit house is a brilliant solution to the age old shelter problem. As many northern mammals know, a burrow in the earth is relatively dry and remains at a steady moderate temperature. 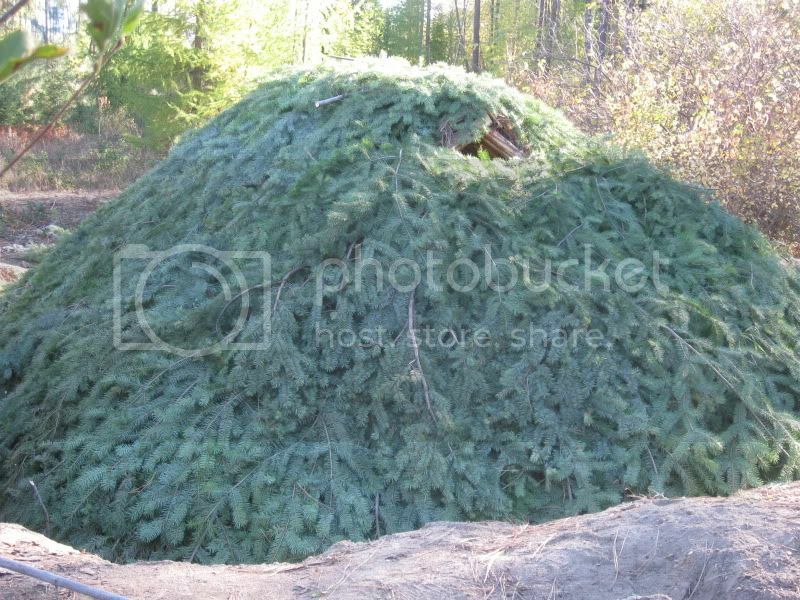 When hides, or suitable tree bark, isn’t available, round timbers and earth are the next best covering. Before the saw, only easily split woods like cedar could be used for boards. I suspect thatch only became popular as as populations rose and forest products became scarce. My design is not a traditional one. It is kind of a hybrid. The traditional house for my region was round, and had an overhead smoke hole which also functioned as the entrance (a ladder was used). I wanted a ground level entrance, similar to what some Plains and Subarctic cultures used. I also opted for a squarish design, and twin smoke holes in the gable ends, after a photo I saw of a Scandanavian ‘earth lodge’ replica. I did this because I didn’t like the idea of snow falling down the smokehole, and because I was unclear about how some crucial parts fit together in the traditional round design. I now wish I had used a more traditional style. I’ll explain why further on. It took over three weeks to build, with some help from my partner. I also had another big guy help me move and set the four large uprights. All the work was done with hand tools. Skinning all the roof poles took the most time. The floor is 12″x12″. This was our home for the winter. It never dropped below freezing inside, even when we were away, despite outside temps in the negative teens F. Taking a hint from the old ones, we burried a storage cache in the floor- a garbage can full of gleaned potatoes. We were also given a whole sheep, by a kind friend, which we kept in a toolbox under the snow outside. Unfortunately my experimental design had some major flaws. The vertical smoke holes turned out to be a particularly bad idea. Smoke drainage was terrible. Because of this, we had fires only briefly to cook dinner. We used a sheep fat lamp, and often hid in bed for heat. 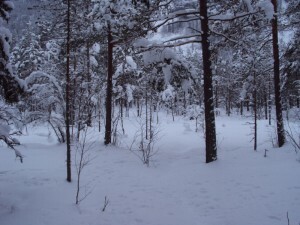 We also found that our covering of fir boughs and sandy soil imperfectly shed rain and melting snow. Moisture gradualy soaked in, a problem exacerbated by lack of fire. Mould grew. I know some groups used a simple brush and soil covering like ours. With clay soil, in a cooler drier climate, that could work. But I’ve since learned that the local villagers used a layer of cedar bark shingles. I’ve also seen good photos which clearly illustrate how thier round design was fit together. Live and learn. I also wish we’d have used a better floor covering, since our things tended to get filthy. In any case, we survived. We certainly kept warmer than we would have in a tent or similar open air shelter. We were eager to move back into the tent in the spring. But then, so too were the natives, who spent thier summers in well ventilated tule mat lodges. 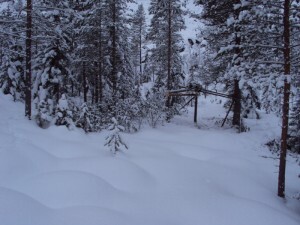 This winter, I stayed in the tent while at home. Being single now, I’m less concerned with comfort. Also, I’ve developed an ironic allergy to the mould in the pit house. I use it for a tool shed and cellar. I think I could fix the smoke problem by cutting back the roof poles to make one long overhead vent. I could also fix the leakage by pulling off the earth covering and installing cedar bark shingles. I don’t have cedar on my land, so I’ve have to truck it in. For now, this isn’t a priority. There are some amazing pit house replicas built by native groups in BC. I think one of the most impressive is the Sinixt pit house in Vallican, BC. It is the gold standard in my eyes. I can’t find good pictures of it now. One day, I would like to build a proper pit house like this one. Building a structure like this gave me deep appreciation for the ingenuity and industriousness of the natives. Building a full sized pit house, with stone tools, would take expert planning, huge amounts of labor, and a considerable food surplus. These were obviously not the work of starving savages. 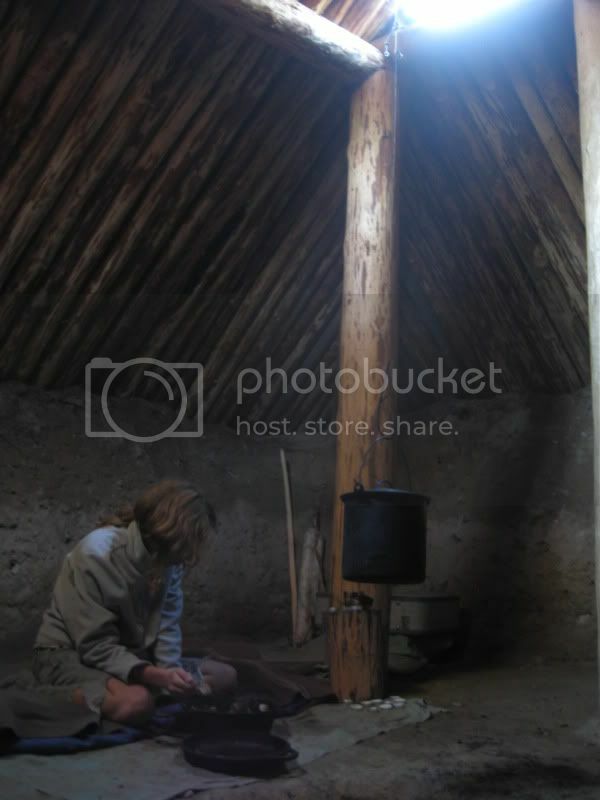 Rather, the existance of pit houses is a testament to the affluence and organanization of past societies.